SurferEQ 2 is a ground-breaking pitch-tracking equalizer plug-in that tracks a monophonic instrument or vocal and moves the selected bands with the music. Original asymmetric, morphing EQ algorithms. Side-chain input enabling external pitch detection. Spectral Gate (normal and reversed). 3-mode MIDI control, including an innovative EQ Instrument mode. Spectrum Analyzer and Spectral Level Meters. Live mode with zero latency. Four new and extremely creative Harmonic Filter modes. Added PACE iLok for protection and easy mobility. Completely re-designed, retina-compatible and OpenGL optimized vector graphics UI. 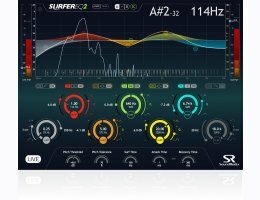 SurferEQ is available for Mac & PC in AAX, RTAS, VST and AU formats, 32 and 64 bit.